Many consumers have been deceived. 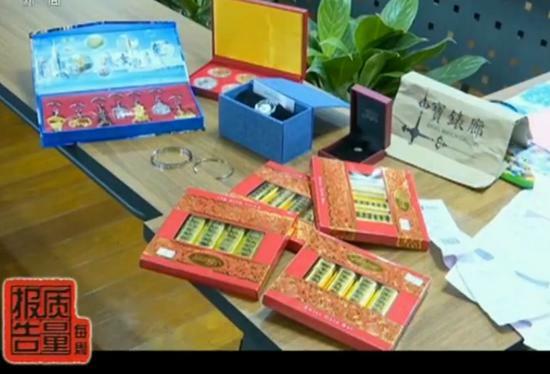 The trip to Hong Kong and Macao has become a "bad travel"
During the Spring Festival, a Shanxi consumer, Ms. Xing, was forced to shop in Hong Kong. When I arrived at the jewelry store, the tour guide said that you bought it in an hour. We walked for 1 hour, 5 hours, and we walked for 5 hours, meaning that you can't buy it. Then I went to the watch store, which is the same arrangement as the jewelry store. Then I went to the chocolate shop and you can't buy it. Ms. Xing said that her family of three had suffered from compulsory shopping, non-commitment of accommodation, cancellation of planned attractions, etc. during the five days and four nights of Hong Kong and Macau. The trip was also contacted by Ms. Xing’s mother through Baidu search. A travel website that calls itself a national travel begins. At that time, my mother saw the travel agency of China International Travel Service on Baidu. Then she found the contact information through the website. After adding the WeChat of the staff, she paid the deposit in advance and booked our next itinerary. Then in the process of this contact, he promised us not to force consumption. The reporter opened the website provided by Ms. Xing as avcits.com website. The words “China International Travel CITS” marked on the top left of the page are very eye-catching. The reporter noted that this website is mainly operated by Hong Kong and Macao. The bottom of the page is also clearly marked "China International Travel (Shenzhen) Travel Agency official website", the address is "Shenzhen Luohu District People's South Road Xin'an Building". Subsequently, the reporter dialed the hotline on the webpage, and the staff on the phone asked for a further contact with the reporter's WeChat. An avatar is China National Travel CITS, and the nickname "China International Travel" has added a reporter's WeChat. 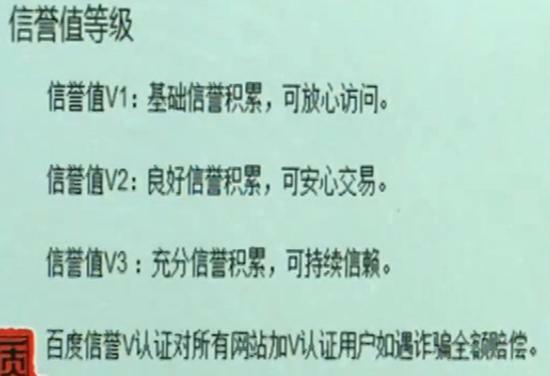 The staff member who claimed to be "China International Travel Service" sent a reporter's travel itinerary to Hong Kong and Macao for five days and four nights. The reporter noted that the top of the itinerary is also marked with the words "China International Travel CITS" and "China Travel (Shenzhen) International Travel Agency". So is this website of Ms. Xing’s participation in Hong Kong and Macau is really the official website of China Travel? According to the customer service notice and the address left on the website, the reporter came to “Xin’an Building, Renmin South Road, Luohu District, Shenzhen”. The reporter did not find the travel agency of this nominal national travel. The staff of a regular travel agency operating here answered the reporter's question. Reporter: Is there a International Travel Service (Shenzhen) International Travel Agency? Reporter: Is there any Xin'an Building here? Travel agency staff: The websites you check online are fraudulent, the website is fake, the address is fake, too much fraudulent use, Baidu search, roadside card, address is written here. According to the industry insiders, many illegal organizations of counterfeit international travel are using this address to deceive consumers and even force the National Travel Service. These counterfeit travel agencies are commonly known as “Wild Horse” travel agencies in Guangdong, mainly by impersonating other company names, counterfeit travel agency license numbers, using the Internet to publish false information and organizing illegal travel projects. The reporter then provided relevant information on the website to Guolv (Shenzhen) International Travel Service Co., Ltd. to verify the authenticity. 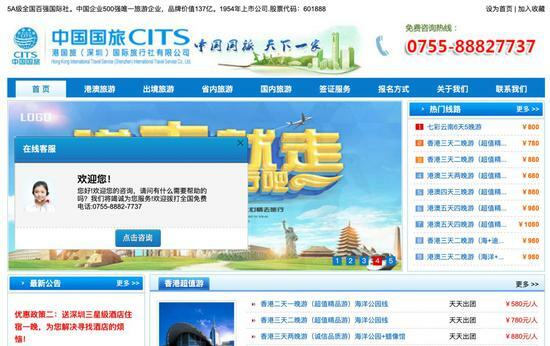 After our multi-party verification, there is no avcits.com website in our China Travel Service Shenzhen, including the China Travel Business Department of Xing'an Building. In the interview, the reporter found that the similar experience of Ms. Xing is not a case. These fake travel agencies publish advertisements and related information through the Internet, organize so-called Hong Kong and Macao tours, and have formed a black industrial chain. During the Spring Festival from February 4 to 10, 2019, the Consumer Council of Shenzhen received a total of 26 complaints from the “Hong Kong and Macau Tour”, all of which involved the “Wild Horse” travel agency. Among the 26 complaints, a woman surnamed Liu of Shandong passed Baidu search and selected a travel agency called Shenzhen International Travel on Baidu Plus V-certified website, and paid 7600 yuan to participate in a 5 day 4 night Hong Kong and Macao tour group. . During the trip, tourists were forced to purchase jewelry, gold, chocolate, watches and other items that they did not want to buy at all. Most of the tourists were forced to spend more than 2,000 yuan per person. I don't want to have any conflict with every guest. To be honest, I don't want to quarrel with you. To be honest, I have been a tour guide for more than ten years. I have never lost a fight. If you want to play, I can find a professional to accompany you. In addition to compulsory shopping, even the hotel and meals were all downgraded. The so-called Samsung Hotel is actually a room converted from an underground warehouse. More than a dozen people lived in a room, the bunk bed in the basement, and mixed with men and women. They were stupid at the time, saying that this is a three-star hotel? Sharing a bathroom, they feel incredible. The staff of the Shenzhen Consumer Council told the reporter that there are some common features in the complaints they accept, that is, tourists are almost all consumers outside Guangdong Province, and 90% of consumers obtain travel agency information through online advertising, among which 50% of consumers searched for “National Travel” through Baidu. After seeing the so-called national travel information with V certification on the page, they decided to sign up for the delegation. 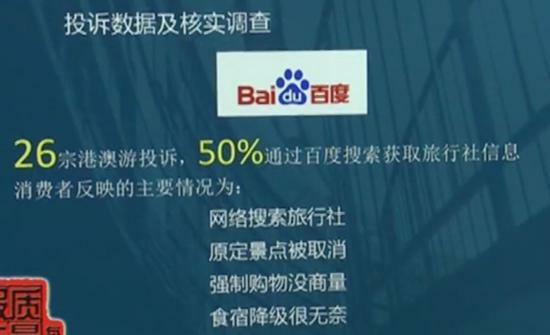 The Shenzhen Consumer Council simulated the actual usage scenarios of consumer networks and conducted a special test survey in Baidu search. After the staff entered the keywords such as “Hong Kong and Macau Tour”, the first message on the front page was an advertisement message called “Shenzhen International Travel Agency”. The reporter noticed that the blue V2 rating was clearly marked at the bottom of the information. Words such as certification and advertising. Click on this information, the top left of the page reads "National Top 100 Best Travel Agents". After opening the online customer service consultation, the dialog box immediately pops up "Baidu Certification, you have entered the official customer service center", and the upper left of the dialog box is also clear. Marked "Shenzhen International Travel Service". However, verified by the staff of the Shenzhen Consumer Council, there is no such enterprise in the registration information of the commercial entity. Further investigations indicate that the use of false information in Baidu Plus V-certified websites is not unique. According to Baidu's promotional materials, Baidu's credibility V certification is Baidu's verification of the website's main business qualifications, website security, website authority, etc., and displays the blue official website logo on the right side of the official website title of the search results. Help netizens quickly identify authoritative high-quality websites and prevent infringements of netizens from websites and phishing websites. After the special test investigation, the Shenzhen Consumer Council held a briefing on the investigation of the complaints of the “Wild Horse” travel agency in Hong Kong and Macao. Consumers were deceived by the Baidu search advertisement for Hong Kong and Macao tour “Wild Horse” travel agency. The Shenzhen Consumer Council relied on “Consumer The Law on the Protection of Rights and Interests sends a letter of supervision to Baidu. According to experts, according to the provisions of Article 34 of the Advertising Law of the People's Republic of China, advertising operators and advertisement publishers check relevant documents in accordance with laws and administrative regulations and check the contents of advertisements. Advertising operators may not provide design, production, or agency services for advertisements that do not conform to the content or prove incomplete documents, and advertisement publishers may not publish them. Most of these victims received information from Baidu, so Baidu originated from its bidding rankings. 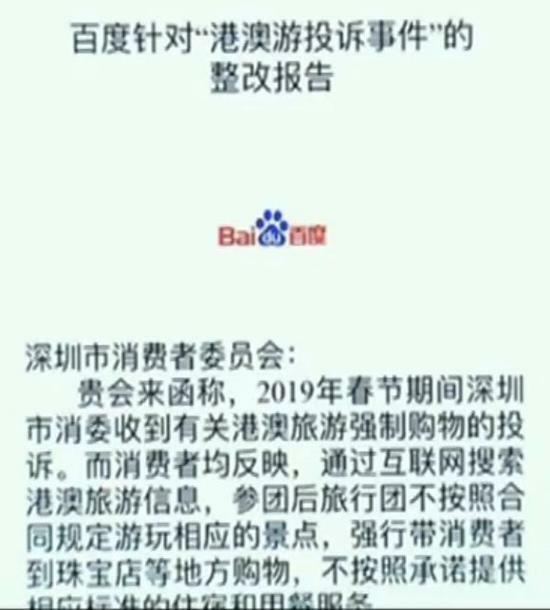 After everyone’s experiments, many of the 20 previous ones were fake, including the National Travel Agency’s complaints for many years, but the results were minimal. .
After the Shenzhen Consumer Council sent the supervision letter, Baidu responded, which explicitly mentioned that the Baidu Credit V certification advertisement of the travel agency in Guangdong was suspended; the Baidu natural search results were cleared; and a Baidu netizen rights protection plan was promised to be victimized. Consumers pay first. However, by the time of the reporter's deadline, a group of 40 tourists including the Shandong consumer Ms. Liu had not been compensated. In response to this phenomenon of “wild horse” travel agency information on the Internet, experts have proposed that punishment and illegal activities should be equivalent, so that they will receive the desired effect. It should be joined hands, and the effective connection between the two laws of administrative law enforcement and criminal justice should be formed, and it should be thoroughly managed and severely cracked down. At present, the public security organs have been involved in the investigation, and the investigation of this tourism black industry chain is still in progress. Nokia 7 Plus: feelings Nokia's "sincerity revival"
Will iPhone X Plus be like the previous Plus model? Wechat gives up "no V"?